Click here to find out about national academic competitions. We are hoping to be even bigger and better this year. Are you a teacher or author who would like to help us judge these talented entries? Please contact Carrie Clark. 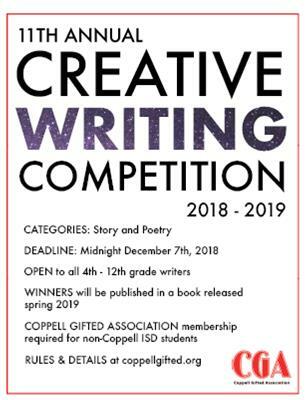 deadline Friday, December 7, 2018, midnight. CGA membership required only if student does not attend CISD schools. Each entry will be judged based on its artistic expression; however, technical merit will also be a factor. Finalists (evaluated by student grade and category) will be announced in February 2019.. The winning entries will be published in a book that will be available in the spring. Students need not be identified gifted to participate. Interested in what happened in previous competitions? Click HERE to see results from the 2016-17 Competition. Click HERE to see results from the 2015-16 Competition. Results are available by clicking here: RESULTS AVAILABLE HERE. Click here for more information about the book orders and book release party: Books & Party, Party Pics. 2012-13 CGA Creative Writing Competition. Results are available by clicking here: FINAL RESULTS. Click here for more information on Book Orders and the Book Release Party: Book Orders and Book Release Party. Click here for Creative Writing Competition RESULTS. For information on the CGA Book Relase Party on April 7, 2011 (or the link to pre-order the book), please click HERE.